NOTE: Kate Grigg is an active member of the Madison County KFTC chapter and has recently left her position as Eastern Kentucky Organizer for the Fairness Coalition. She will leave Kentucky this summer to pursue her studies, and she offered up this reflection on her time working to pass a local Fairness ordinance in Berea. As I leave my position with the Fairness Coalition, I am reflecting on the story of Bereans for Fairness. 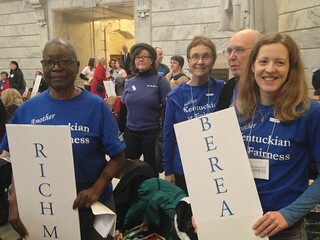 I started this job as Eastern Kentucky Regional Organizer in September of 2012, but Bereans for Fairness and I go back to the spring of 2011, just after I moved to Berea and just as the debate for Fairness began. Do you remember the second public forum at the community school? 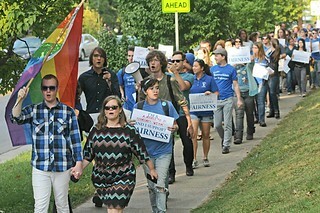 Hundreds of people showed up, the majority of them wearing blue to show their support for Fairness. Bereans for Fairness was born and we have been at it ever since. In September of 2011, we worked with the Fairness Coalition and Kentuckians For The Commonwealth to organize an incredible rally and march. Hundreds of people gathered in front of Union Church. People shouted in front of the Berea Municipal building where city council holds its meetings. That same day, the city council voted to re-establish the Berea Human Rights Commission (HRC), reportedly a “first-step” on the way to Fairness for Berea. Since then, Bereans for Fairness has showed incredible stick-to-itiveness. It has been slow-going and, at times, painfully frustrating. Yet, we have continued to meet and organize and do our best to keep the Fairness conversation on the forefront. We have held welcome receptions for the Berea HRC, led anniversary marches, and organized summer picnics. We have attended city council meetings and had individual conversations with council members and candidates, our mayor, HRC members, neighbors and friends. We solicited support from local businesses; at current count, we have an impressive list of 32 Business Supporters for Fairness. We have shared powerful stories and letters about why Fairness matters to us. We have flooded the council and the mayor time and time again with messages of our support for Fairness in Berea. We have also taken our voices to Frankfort, lobbying for a Statewide LGBT Fairness Law. We are on the eve of having a first reading on an anti-discrimination Fairness ordinance in Berea. I am confident that this passionate, dedicated group of folks who call themselves Bereans for Fairness will not let up until we pass Fairness. What we are asking for is simple: basic civil rights that provide protection from discrimination in the areas of housing, public accommodations and employment based on actual or perceived sexual orientation and gender identity. No, these protections don’t already exist. Yes, they are needed. Isn’t it time for Berea to stand up and pass this ordinance? As was expressed at a recent Bereans for Fairness meeting, the gift of the long struggle to pass this ordinance is the community of dedicated, caring folks who have formed around this work. I am grateful to have been a part of that. The ordinance will come; I know you will see to that. In the meantime, know that y’all have already made a difference.